One of the greatest lessons I have learned during my 11 years as a stay-at-home dad is that if you are willing to cook it or bake it yourself it will probably be cheaper, healthier, or taste better than buying it from the grocery. Most of the time it is all three. However, this would not be possible without the hard-working food bloggers and food websites that share their recipes. Countless times I have wondered...Can make that myself? And every time I have learned that I can, because someone else must have wondered the same thing, invented a recipe, and shared it online. 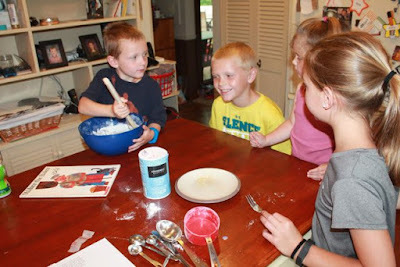 I have learned how to make homemade birthday cake, homemade whipped cream and homemade granola bars; all of which I like better than buying from the store. 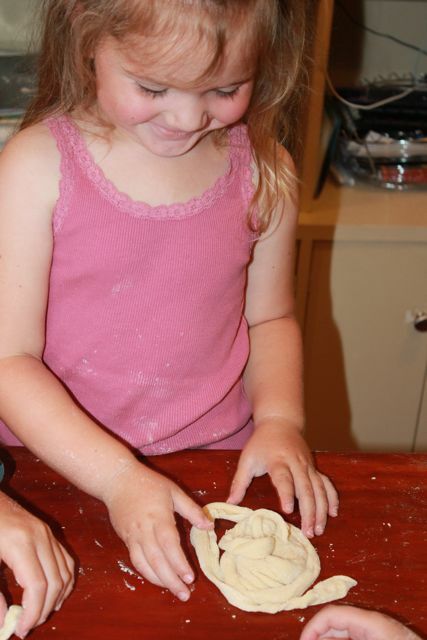 I wish I had the time and desire to spend the whole day in the kitchen. I could probably make everything my family eats from scratch. I know it is unrealistic to think that anyone could do that, but I do love learning new recipes to make things myself instead of just picking it up from the store. 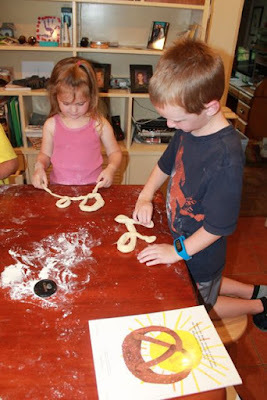 This week I can thank Walter the Baker and Eric Carle for teaching me how fun, easy, and delicious it can be to make homemade pretzels. 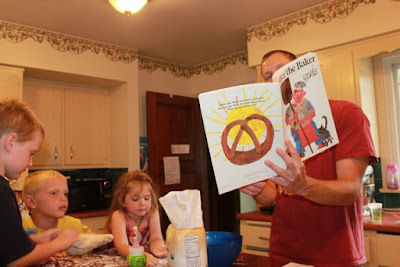 This is our 5th birthday celebration for Eric Carle, author and illustrator of The Very Hungry Caterpillar. This year we read Walter the Baker. It is a story about Walter, his wife Anna, and their son Walter Jr. They make the most delicious sweet rolls in the town. They are so delicious that Walter Jr. is responsible for delivering sweet rolls to the castle for the Duke and Duchess to enjoy each morning. 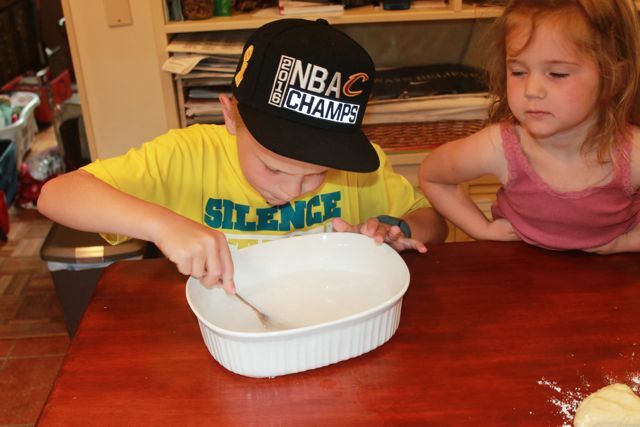 One day, the family cat spills the milk and Walter decides to use water instead to make his sweet rolls. The Duke is furious when his sweet rolls do not taste right and wants to banish Walter from the town. Walter pleads with the Duke and is granted a chance to redeem himself if he can bake a roll from one piece of dough that the rising sun can shine through three times. Walter struggles to come up with a roll and in a fit of frustration throws his last piece of dough up in the air. It twists and turns and falls into a bucket of water. 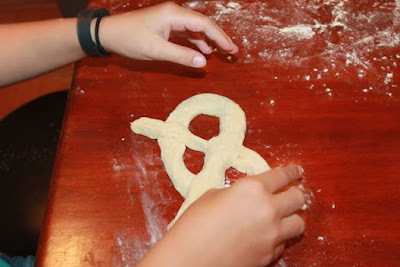 His son Walter notices the dough and his wife Anna puts it in the oven to bake. 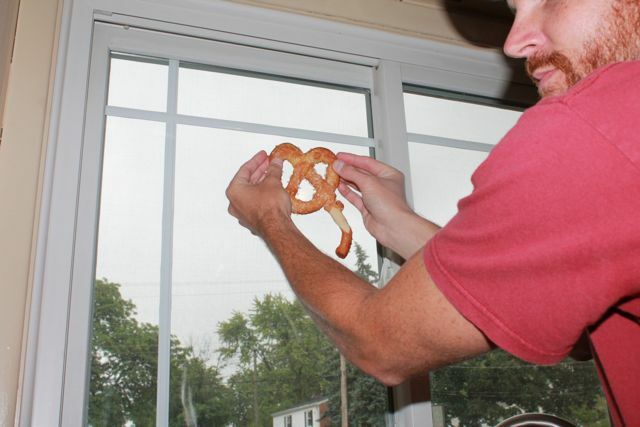 As a result Walter the Baker bakes a pretzel and the Duke loves it! 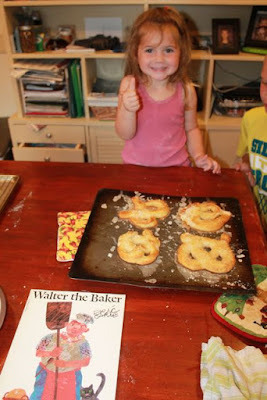 I thought it would fun to make homemade pretzels just like Walter the Baker and Eric Carle's Uncle Walter. I found a recipe online and we set to work. 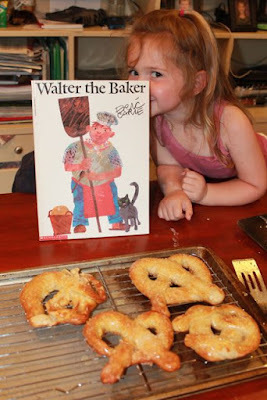 My daughter and I read Walter the Baker and then got out the ingredients to make pretzels. 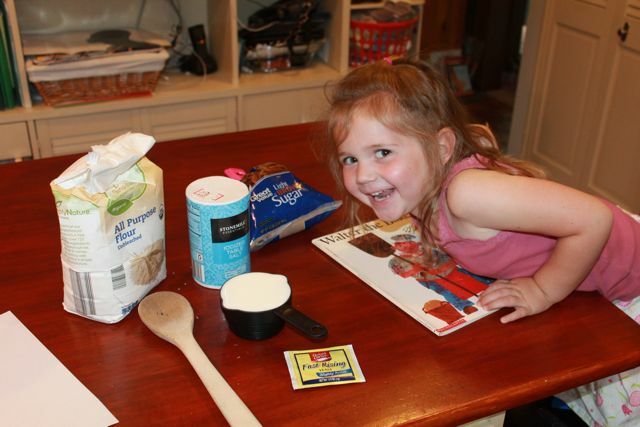 She added the yeast to the warm milk. 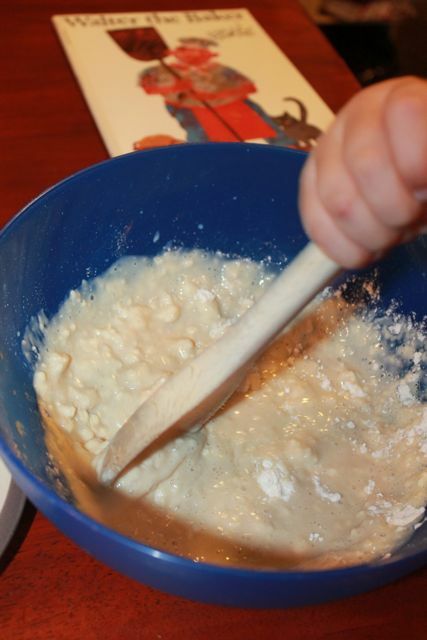 She stirred in the flour, brown sugar, and butter. 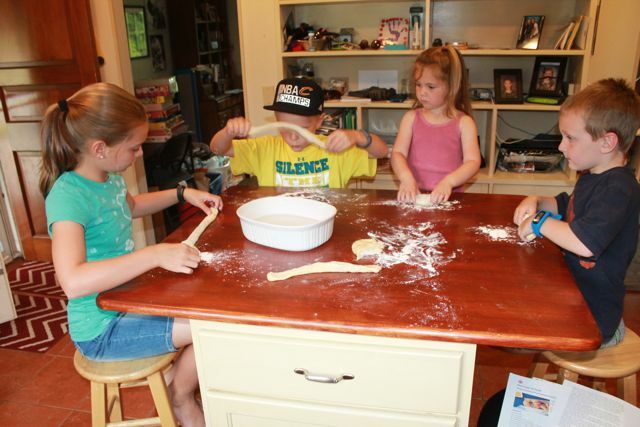 Her brothers and sister quickly found out we were making pretzels. They helped stir in more flour. 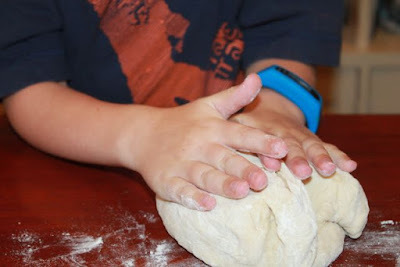 Everyone had a chance to knead the dough. We let the dough rise and we read Walter the Baker again. Once the dough had risen we divided it into six parts. My son prepared a baking soda and water solution. 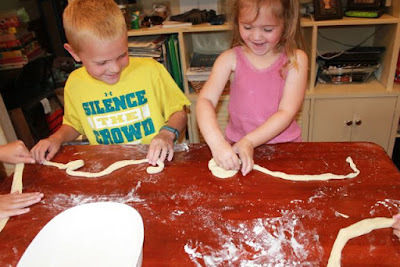 They rolled and stretched their dough. 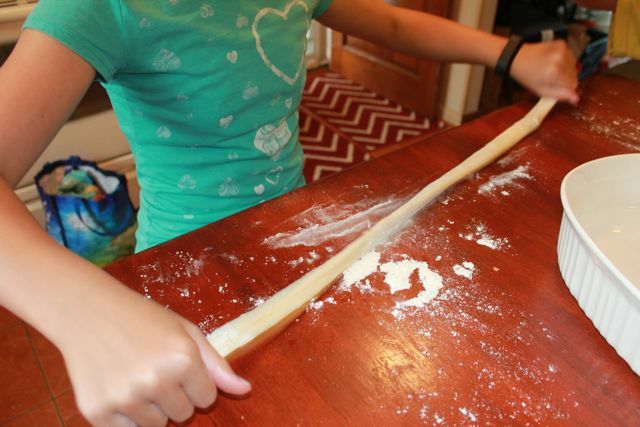 The recipe called for the dough to be stretched to 30 inches. 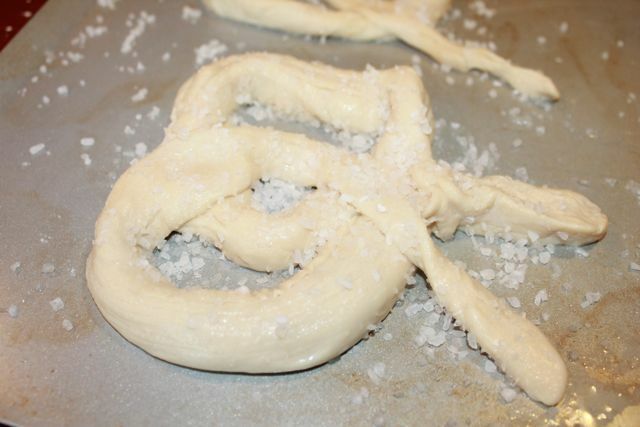 Then, we twisted the dough it into a pretzel shape. We had to have three holes for the sun to shine through. It wasn't as easy as we thought. But, she was having fun. Eventually, everyone made a pretzel shape. We dipped the pretzels into the baking soda solution and placed them on a baking sheet. 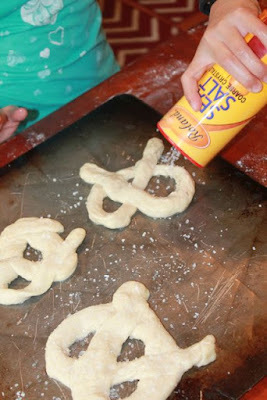 Then, they added some coarse sea salt. They soon learned that a lot of salt is not necessarily a good thing. We baked them for about 10 minutes and they turned out great. 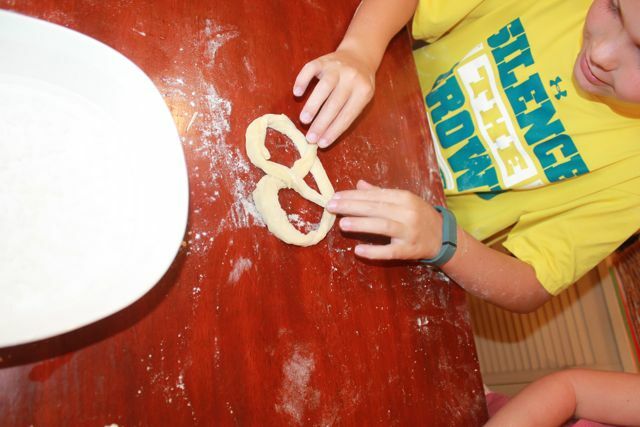 I think the Duke would be happy with our baking. 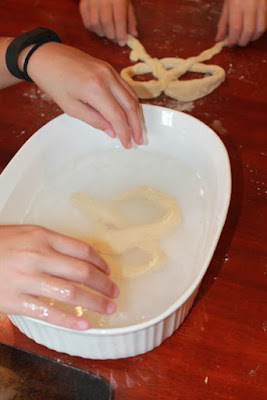 We dipped the pretzels in butter to make them extra yummy and then it was time to enjoy. We recommend this book and we hope you try making your own pretzels. 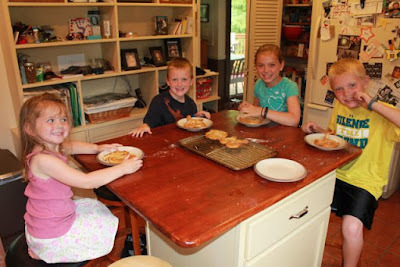 They were delicious and fun to make together as a family! 13. 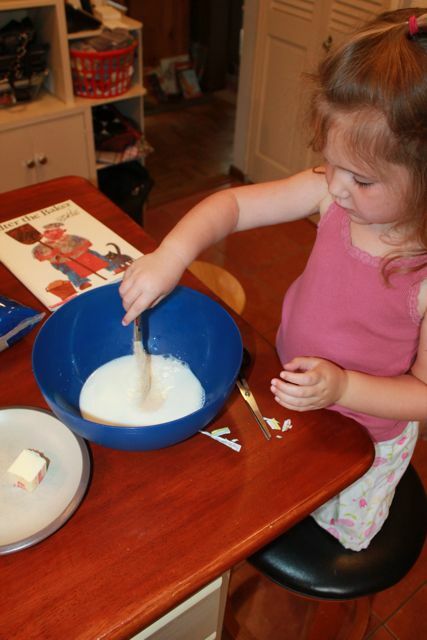 Eric Carle activities on Pinterest - Great board with tons of ideas!